My struggles to take ownership of my painting took a long time. The paintings have evolved, as have I. One of my earliest ones, still in possession, is one I did when I was 18. Although it is rather gloomy, it’s still one of my favorites because it really expressed some feelings I was having at the time. 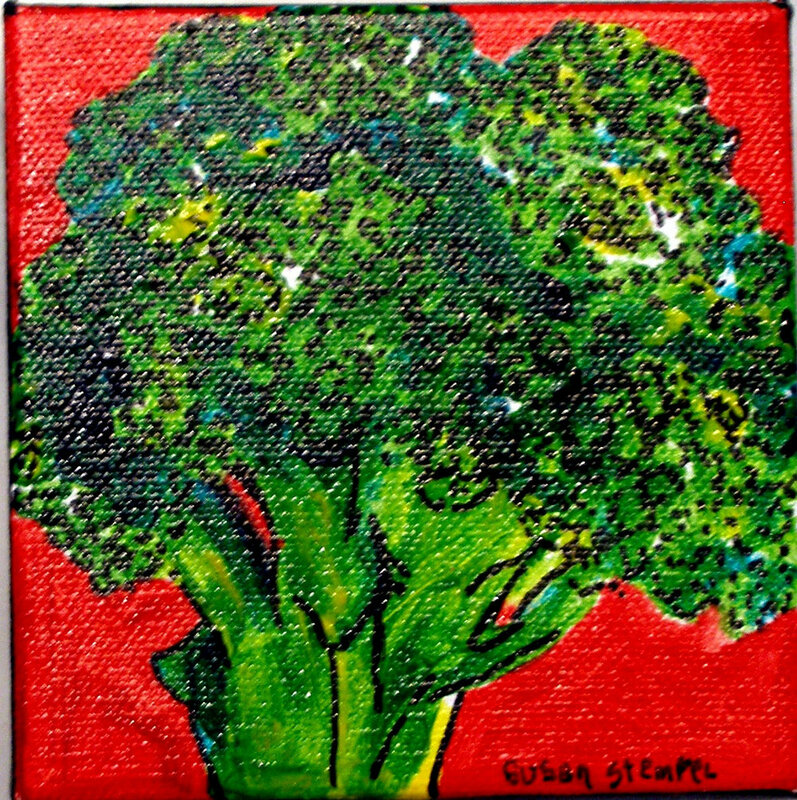 When I began painting a lot about nine years ago, I worked very small—4” x 4” on boxed canvas with acrylics. Almost all of my work was of close-ups of fruits and vegetables. Later, I was working quite a bit larger and did a study of a Matisse painting he did of his wife, Madame Matisse. It wasn’t until long after I finished the Matisse study (which I did in a much brighter palette than Matisse) that it occurred to me how very much it resembled my college painting, but showed a happy side that hadn’t been evident in my early work. Still another painting around this time, and while I was still painting “big”—20” x 30”— was a quadrant of flowers. It took a subject that I loved—very close-up images of plants—and expanded it in a new way for me. This, too, is acrylic and on canvas. Once I started painting regularly, it was clear that I couldn’t continue painting the large canvases—where to put them? So I painted a lot of the 4” x 4” acrylic on boxed canvases (as mentioned and shown here), and very gradually, I moved to ink on paper. Ink was a very accommodating medium for me, and I could work most anywhere with it. Again, I was painting small—anywhere from 4” x 6” to 8” x 10.” I love working in the ink because of the vibrancy of the color and the ease of using it. I am so glad you have taken time to look at my web site. It’s an honor to have your interest. To keep up with what is happening with my work, I invite you to become part of my free Facebook by joining, Suki’s Happy Art for Amazing People. It’s free, it’s fun, and we would love to have you. Let me know or click the link above, and I will register you .